Most men don't know these engagement ring basics. Buying an engagement ring is a big financial and emotional investment and is a crucial part of proposal etiquette. Although you’re excited to propose and might just want to rush ahead and purchase the ring already, it’s important to keep a cool head during the process and make sure you’re making the right decision. While picking the wrong engagement ring probably won’t cause her to say “no”, it’ll likely cause a bit of unnecessary awkwardness. Don’t just buy a random diamond ring on a whim. In order to choose something she’ll absolutely love, you’ll need to do a bit of detective work. First, there’s no better place to look than her actual jewelry collection. See what kind of colors, styles and shapes she prefers. If you notice a lot of vintage jewelry, then a super chic, modern engagement ring is probably not the best choice. Of course, you can also ask her closest friends for their opinion, as long as you’re sure she won’t find out! Picture this: You show her the engagement ring and she’s ecstatic. She slips it on her finger, and — it doesn’t fit. On the car ride home, it’s wobbling all over the place and falling off. Or worst yet, it’s squeezing her finger too tight. There are a few ways to figure out her ring size; 6-6.5 is about the average ring size for women, so you want to use that as a starting point. Then, you can sneakily borrow one of her rings and measure. If you’re feeling extra brave, try to measure while she’s asleep (although hopefully you have some extremely clever excuses prepared if she wakes up!). Ideally, one of her friends already knows her size, so check with them first before attempting some risky James Bond missions. November to February is prime time for engagement ring shopping. If you decide to buy during the busy season, you’re going to risk paying a lot more for the same piece. 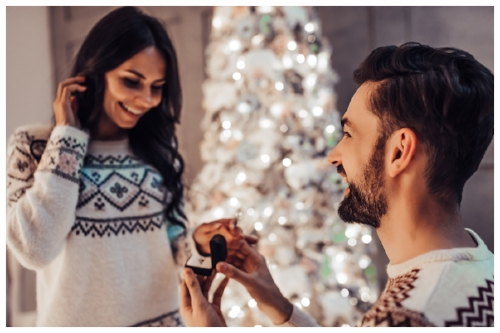 Even if you plan to propose during the romantic holiday season, it’s best to start shopping early on. Less demand means a better price for you. And if you’re looking for a unique, custom engagement ring, be prepared to invest at least 2 weeks in the process. If you’re like most people and are going with a diamond engagement ring, you want to pay particular attention to the diamond’s cut. While “cut” can refer to the diamond’s shape, it also refers to how the diamond reflects light. 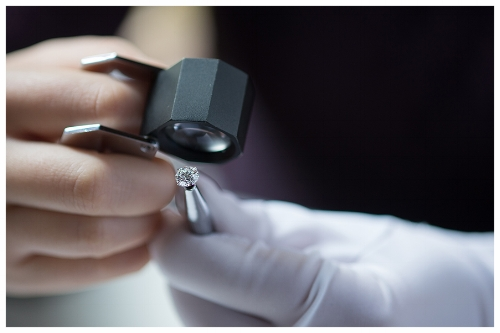 Make sure the diamond you choose is GIA or AGS certified, and find out the cut grade. Generally, you’ll want to stick with “Excellent” or “Very Good”; anything lower will not offer the brilliant sparkle you want for an engagement ring. A skilled craftsperson is the best person to talk to when it comes to choosing your engagement ring. Someone who’s been working in the jewelry trade for years will be much better at answering your questions and explaining your options, compared to a salesperson at the department store who has little real-world jewelry experience. Even better, a custom jeweler can walk you through the entire process and help you choose the best design, stone and setting. A custom engagement ring is best if you want to make her ring extra special, but be aware that it won’t be ready overnight. 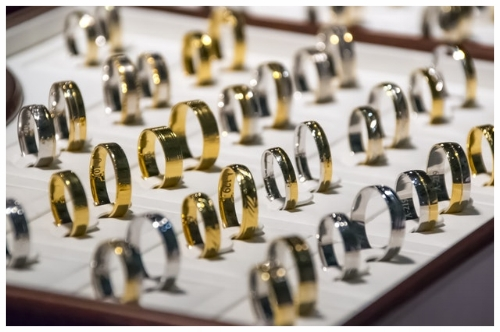 Fortunately, since retail stores have higher overhead costs, stunning custom rings can actually be much cheaper. It’s definitely possible to find an engagement ring that doesn’t empty your wallet, but this requires careful planning, research, and working with a jeweler you trust. You want to be clear from the outset exactly what is important for the piece. If you know she absolutely needs a massive diamond in the center, you’ll need to incorporate those increased costs into your budget. Make sure you factor in the cost of the setting, diamond, manufacturing, etc., into the final price . If you’re working with an honest jeweler, they’ll have your best interests in mind, but it’s still always good to be as well-informed as possible. Unless you’ve already discussed it and are buying a ring together, you probably want your proposal to be a surprise. You definitely don’t want her to find out ahead of time and spoil one of the most exciting moments of your lives. If you share computers, make sure you clear your history and cookies, and do your shopping in a private browsing window. Trust us, she’s going to notice those mysterious Google ads for engagement rings popping up everywhere! Remember to hide any receipts or paperwork related to the purchase. And of course, if your finances are already shared, make sure she doesn’t see any huge deductions from your bank account or purchases on your credit card. This especially holds true if you’re buying a custom ring months ahead of time. This is a pretty big one. Imagine spending thousands of dollars on her ring, then leaving it on the bus by accident. The insurance will also protect your investment years down the road in case she takes it off and misplaces it somewhere, or worse yet, it’s stolen! Unless you have the budget for it, don’t spend months trying to find an immaculately perfect diamond. Although it’s ideal to find a completely flawless and colorless stone, the subtle difference between that and a slightly more imperfect diamond may not be visible to the eye. As for carat weight, keep in mind that the price tends to increase exponentially the larger the diamond; that’s because big diamonds are much rarer. Even if she might love a 5ct diamond, chances are it’ll cost more than your house! Want to add a bit more sparkle without breaking the bank? Since large diamonds cost much more per carat than smaller diamonds, incorporate smaller stones into the ring to add some cost-effective beauty. Most men get so wrapped up searching for the ideal engagement ring that they totally forget about another upcoming investment, the wedding band. While you generally shouldn’t purchase the wedding band until after your proposal, you’ll want to ask your chosen jeweler for their recommendation. The engagement ring should be crafted in a way to match her wedding band , so planning for the future is essential. Save these tips (somewhere where she can’t see it!) and use this blog as a guide and reminder during your ring shopping journey. These can save you some serious headache, and if you’re lucky, maybe a few thousand dollars! If you’re looking to surprise her even more, a custom engagement ring can be a great choice. Unlike diamond rings found in the store, a custom ring is made just for her. Plus, since there’s no retail markup, it can be much less expensive than a cookie-cutter department store ring. Interested in a Custom Ring?